I'm a sucker for a half-off sale, so when I saw this Easter bunny cake pan on sale at Williams-Sonoma last week, I caved. It was surprisingly easy to make, although my only option was to cover the whole thing in frosting because the seam between the two cake halves ended up being pretty wide. 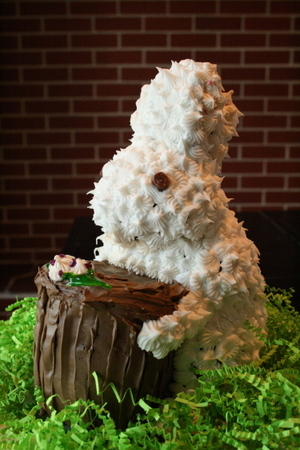 The bunny has a few boo-boos, but it's edible and it hasn't fallen over, so I'm happy. 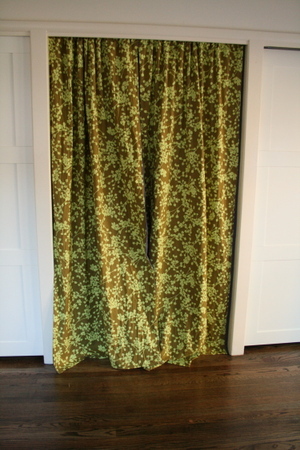 Another project I finally got around to doing: curtains for the closet in our master bedroom. We've lived in our house for almost a year and we finally put up closet doors last weekend. The doors made such a huge improvement I was motivated to sew the curtains to hide the built-in dresser between the closets. The fabric is by Amy Butler with a simple purple-blue cotton lining. One house project down. 20 million to go.